U.S. Economy Added 250,000 Jobs In October; Unemployment Remains At 3.7 Percent Employers added more jobs than analysts expected, as the jobless rate remained at a nearly 50-year low. Friday's report gives voters a final glimpse of the economy before the midterm elections. Job seekers line up at a technology fair in Los Angeles in March. Employers added more jobs than analysts expected last month, as the jobless rate remained at a nearly 50-year low of 3.7 percent. 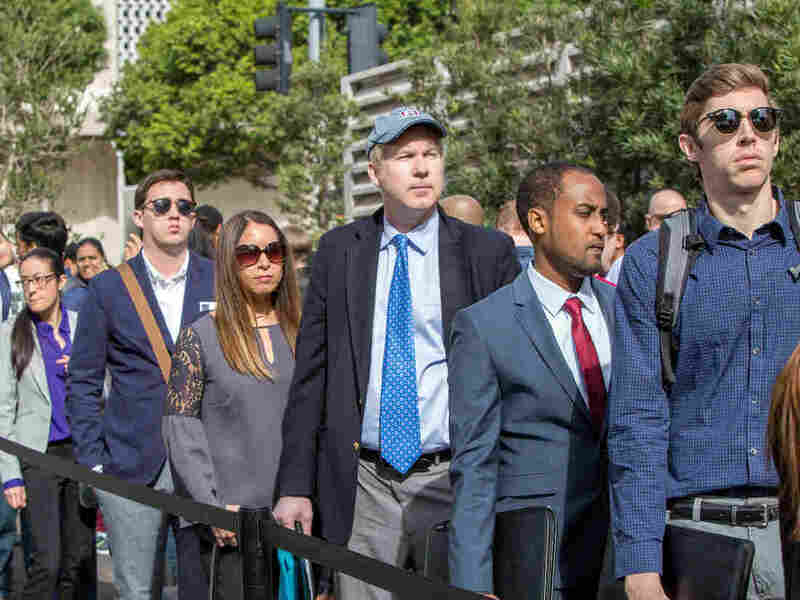 Employers added 250,000 jobs in October, more than analysts expected, as the jobless rate remained at 3.7 percent, a nearly 50-year low, the Labor Department said Friday. The report also showed that the pace of wage growth picked up last month. Average earnings climbed to $27.30 an hour — 3.1 percent above a year earlier. The 12-month wage increase was the largest since 2009 and topped September's 2.8 percent gain. But the 3.1 percent wage gain is still considered moderate. And it's unlikely to change the Federal Reserve's strategy of gradually increasing interest rates. "The moderate improvement in wage growth keeps the Fed on track to hike again in December, and enables them to transition to a slower pace of rate increases next year," economist Mickey Levy of Berenberg Capital Markets said before the report was released. Friday's report gives voters a final glimpse of the economy before Tuesday's midterm elections. The increase in jobs marked the 97th straight month of gains. The economy is currently in one of the longest expansions in modern U.S. history. The number of jobs added in September was revised down to 118,000 from the 134,000 originally reported. The September number was somewhat depressed compared with prior months because of Hurricane Florence, which ravaged North and South Carolina. Hurricane Michael, which hit the Florida Panhandle and Georgia last month "had no discernible effect on the national employment and unemployment estimates for October," the Labor Department said. The rebound in job creation last month was widely expected. Economists had projected the economy added around 200,000 jobs in October. Last month, the economy added 47,000 jobs in health care, 42,000 in leisure and hospitality, 32,000 in manufacturing, 30,000 in construction and nearly 25,000 in transportation and warehousing. One of the most positive signs for workers in the labor data has been the 7.1 million job openings in the U.S. economy. That's more jobs than the 6.1 million people officially unemployed under the government's primary measure of joblessness. Employers know this well, as they continue to struggle to fill openings.